When it’s time to repaint the outside of your home, does the thought of choosing the wrong colors scare you silly? The dizzying array of color choices are enough to give a you a case of Chromophobia (the fear of colors). How do you decide what colors to use when there are so many options? At $50 a gallon or more for quality exterior latex, you can’t afford to make a mistake. And if you don’t like the colors, your neighbors probably won’t either; colors have public impact – you’re not the only one who has to live with them. Fortunately, a little research and planning can help you get started with the confidence that the final paint job is one that you – and your neighbors – will be pleased with. Here’s how to pick exterior paint colors for your Modest Mansion. First – don’t head off to the paint store to start looking at color choices – you’ll be quickly overwhelmed. You’ll also find yourself looking at colors you like, instead of colors that go with your house. 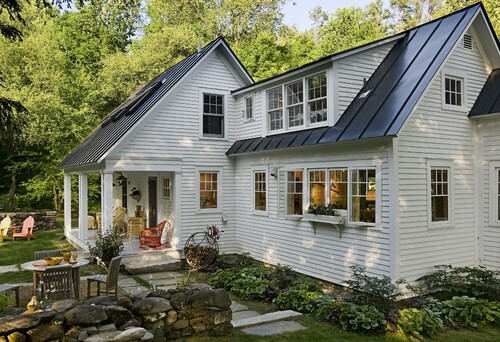 After all, an existing house isn’t a blank canvas – you’re not changing the color of the roof, the brick or stone, and maybe not even the windows (if they’re prefinished). Roofs and masonry walls are large areas of unbroken color and important parts of the overall color palette. Photo by Christopher Templeton – An excellent palette of four colors plus a roof color – tricky to get just right! Second – palettes with more than four overall colors and/or materials will get out of hand quickly and should be left to the pros (color consultant, designer, Architect, etc.). That means if your house already has a roof color and a brick color, DON’T pick out three or more colors for the parts you’re going to paint! A good, basic exterior paint scheme should include up to three colors in addition to the roof color: the field – large areas such as walls or roofs; the trim – corner boards, window trim, fascias, rakes, etc. ; and accent – specific elements including doors, shutters, and other architectural features. The field color is where you start, since it makes up the majority of what you’ll see on the house and will lead you to the choice of trim and accent colors. Let’s start with your goals for your house – are you trying to make it look a little more prominent on the street? A lighter field color will make it look larger; a darker color will visually shrink it. Lighter colors can also make a house look more delicate, while darker colors can give it a strong, solid appearance. Or maybe you’re trying to get rid of an old, dated color scheme, and want something that will look good for decades. Gray-browns are good for that, and blend well with other colors, too. The choice of trim color can make or break the scheme. 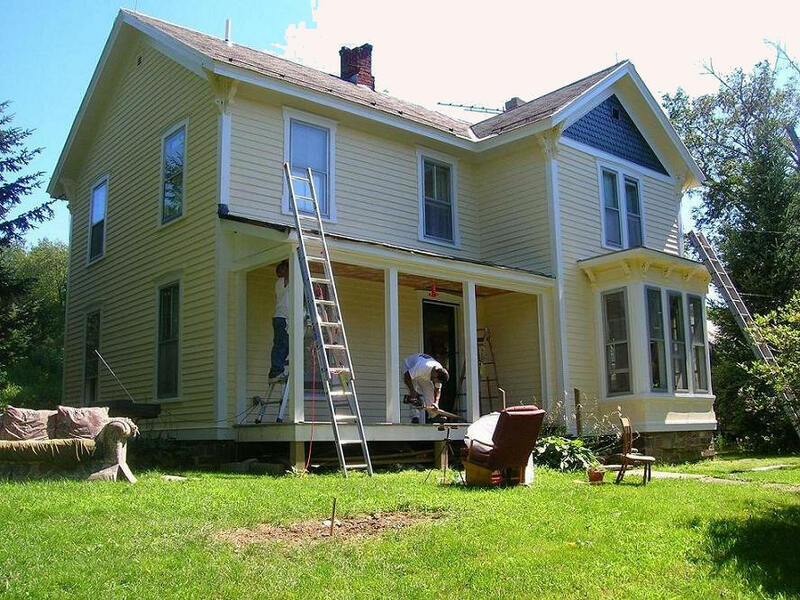 Painting the trim the same color as the field works great on some houses – very light on a Colonial Revival home, very dark on a Craftsman, but the lack of color contrast can give a house an “unfinished” or “wedding cake” look. Be careful with too much contrast – darker trim, especially around the windows, can cause a “frame” effect, where the windows look like pictures hung on a wall. Keeping the trim lighter than the field is almost always a safe bet. Gutters, downspouts, and similar elements should usually be painted the trim color to help them “disappear” into the background. The accent color is where the excitement is. Once you’ve chosen an attractive combination of field and trim, make it “pop” with an eye-catching accent color. It’s a tool to give life to an otherwise muted color scheme and draws attention to the important features of the house. 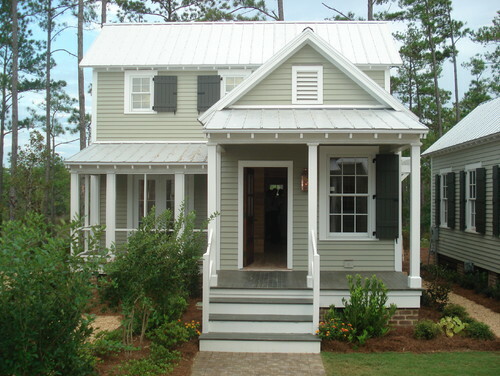 The front door, shutters, and the windows frames (not the trim) are good places for accent colors. Windows painted with accent and trim colors together can be the most interesting part of the composition. The two most important considerations in choosing a color scheme (after the existing roof color) are the architecture of the house and the neighborhood context. Historic architectural styles, for example, look best in their original color schemes, although these can vary quite a bit. Original Colonial and Colonial Revival homes were often quite colorful on the inside, but less so on the exterior. Often they were painted in a single color for the field and trim, with a second color for an accent. Combined with prominent red brick chimneys and a brick or stone base, the effect is a three-color scheme. 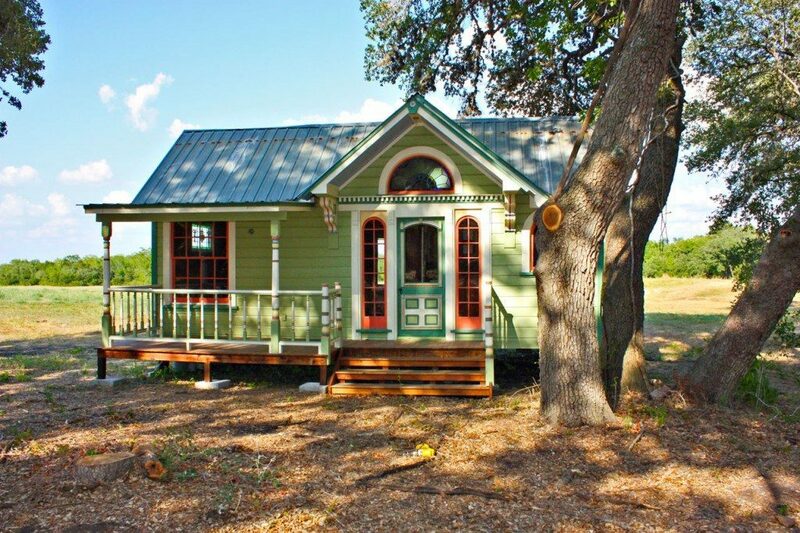 Tiny Texas Houses – This modest “painted lady” Queen Anne is perfectly at home with five or six paint colors! Queen Anne Victorian homes – often referred to as “painted ladies” – sometimes showed off six or more colors of trim and accent. Making that look good today takes the services of a color specialist and a lot of time. But a similar effect can be had with as little as three colors if they’re well placed on the house. 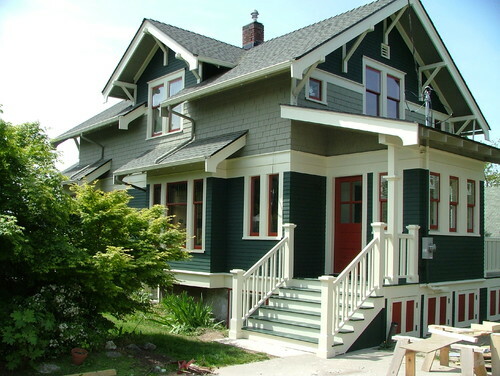 Seattle Dream Homes – Original Craftsman homes often used deep, rich color palettes. 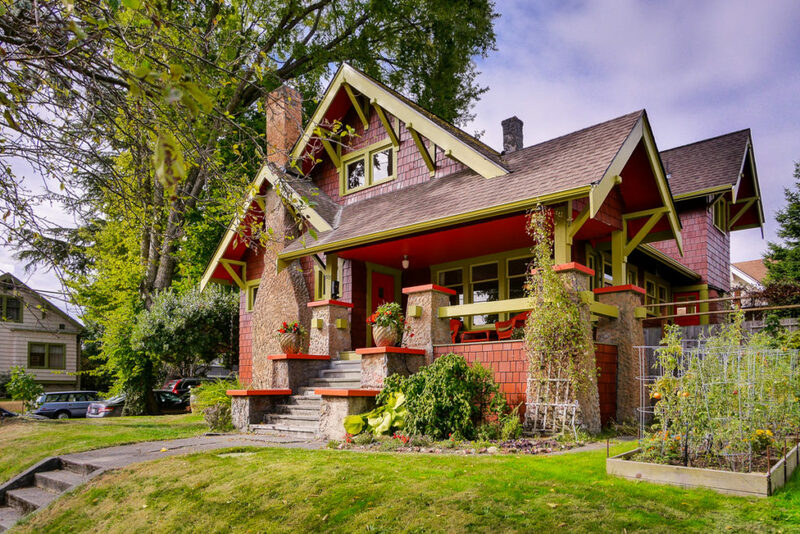 The Craftsman style of the early 20th Century sported a darker, earthier color scheme using deep browns, greens, and reds. The current popularity of the style is making more homeowners consider richer color schemes for their homes. There are TONS of resources available for seeing examples of historically-accurate house colors – take advantage of those. When you’re considering how “bold” your new color scheme should be, take cues from the other houses in your neighborhood. While you don’t want to duplicate what everyone else has done, you don’t want your house to look like it doesn’t belong. A house should have its own personality and style, but houses don’t look good in “party dress” all the time. 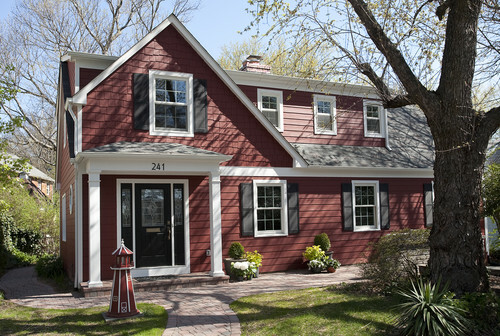 Every color choice must be tried out on the house – don’t ever buy a gallon of paint based on the color chip alone! Most paint stores offer quarts of paint at reasonable prices so you can try out several colors or color combinations before you commit to a scheme. Doing this right is going to take some time and money. Karen and I spent several weeks deciding between at least six different field colors before we made the final choice for our California Contemporary home (Sherwin Williams “Garden Gate” for the field, SW “Sand” for the trim). Get a couple of paint decks (also called paint fans) from a couple of paint manufacturers to get started. Narrow your choices down to two or three paint schemes, then buy a quart of each color – AND a quart of several other colors that are nearby on the color strips. Here’s why – colors that look great on the color strips don’t always look so great on the walls; and you’ll never know until you try them out! Often, darker colors look much lighter on the house – so always get a quart of colors at least one tint lighter than your first choice (“tinting” makes a color lighter; “shading” makes a color darker). Leave the colors samples up on the wall for several days before you choose; look at the color in sunlight and in shade, morning and evening. The larger the area you paint, the easier your choice will be! Whether you’re comfortable with choosing colors or not, you have several resources that can make the decision much easier. 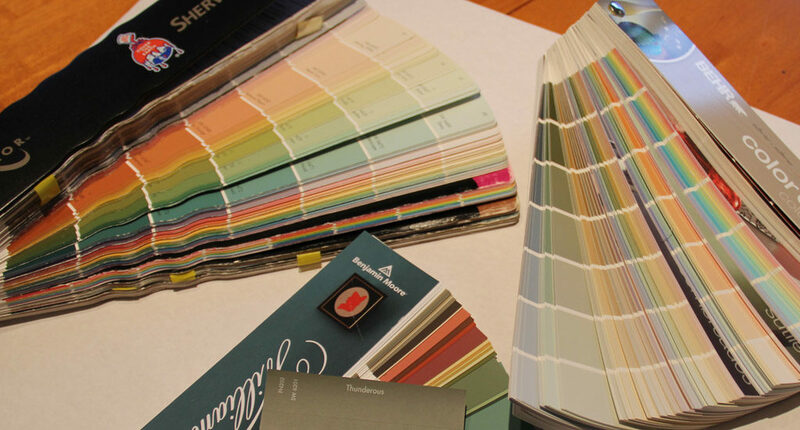 Many paint manufacturers have produced pre-selected color palettes arranged by architectural style or color range that specify compatible field, trim, and accent colors. They’re available at paint and building supply stores and many are very well done. Many paint companies have online paint selection programs that suggest proper color combinations – some even allow you to preview colors on photographs of real houses, or on a digital photo of your own home. Sherwin-Williams.com and Lowes.com both have excellent online tools. There’s a lot more to learn about how to pick exterior paint colors, but now you know the basics.